The Greeks were building labyrinths over 3000 years ago, in a form we now call the Classical seven circuit design. The labyrinth design which brings the walker to the centre through a single path may well have evolved from a basic spiral design the archetypal symbol known to many ancient cultures. 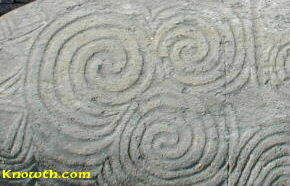 The spirals carved into the entrance stone at Newgrange over 5000 years ago have a similar feel to a labyrinth. Recently constructed labyrinth near the ancient passage mound at Fourknocks, based on the classical 7 circuit design. The centre of the Labyrinth has been modified so that there are no straight lines, like the entrance stone at Newgrange. Recently constructed archetypal Energies Quadruple Labyrinth, at the Labyrinth Center for Peace & Reconciliation, Glore Mill Follain Art Center, Kiltimagh, Co. Mayo, Ireland. 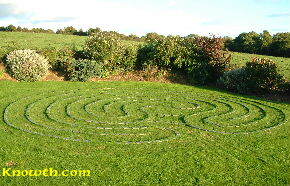 Labyrinth at the An Tobar retreat house in Ardbraccan, Co. Meath, Ireland. 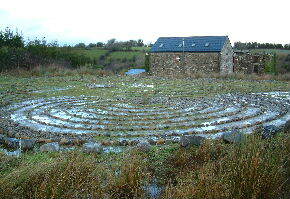 Labyrinth at The Fold, Co.Antrim a place where retreats, therapeutic process, personal growth and creative expression, has been offered since 1997 in an atmosphere of peace and tranquillity. LabyrinthIreland.com - dedicated to raising the awareness of labyrinths in Ireland. The Labyrinth Society - based in the USA, members worldwide. 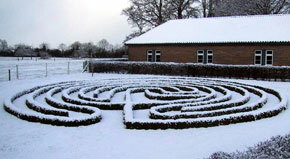 Labyrinth Locator - worldwide database of labyrinths. Labyrinths from Wikipedia (free encyclopaedia). Labyrinths from the Mid-Atlantic Geomancy site.